How different can marketing to millennials be? A lot can change in a generation, Karen.1 Not only from a technological standpoint, but also how people work, think, and live. Each generation comes equipped with their own set of values, fears, and beliefs and though it’s impossible for every member of a generation to fit into a single stereotype — trends do prevail. In this article, we cover how best to approach marketing to millennials with tips on how to win them over. Continue reading or jump to our infographic for tips to reach millennials. We won’t bore you with the usual: Millennials are those born between 1981 and 1996, coming of age in the 21st century. Instead, let’s dig into the psychographics of a millennial with a profile of one. Dylan is a 26-year-old business school graduate who has struggled to find his calling. Instead of going immediately into the workforce he took a year off to “find himself.” Unfortunately for Dylan’s parents, he still lives in his childhood room that they never got to convert into an office. With daunting student loans and additional credit card debt from a year of self-reflection, his mom’s dream for a home office is fluttering further and further away. Dylan is looking for work but doesn’t trust established companies because — despite studying business — he wants to work for a company that makes a real difference in the world, and isn’t just driven by profit. So what can we learn from Dylan? And how does he compare to the general population of millennial consumers? Although we would like to have confidence that all millennials fit into this description, that is obviously not the case. So proceed with caution, and understand that the following are generalizations that refer to a large majority of the target audience. Millennials value their freedom of thought and personal expression, which explains their skepticism of big business and willingness to share on social media.3 They yearn for the approval of their peers and being perceived as unique. Most millennials support small and medium-sized businesses and actively oppose large enterprises. The personal finance industry is a perfect case study of how the values of millennials are changing the landscape. They have been the first to abandon traditional investment advisory services like Charles Schwab, Edward Jones, and Goldman Sachs and rapidly adopt disruptive competitors like Robinhood, Wealthfront, and Betterment. 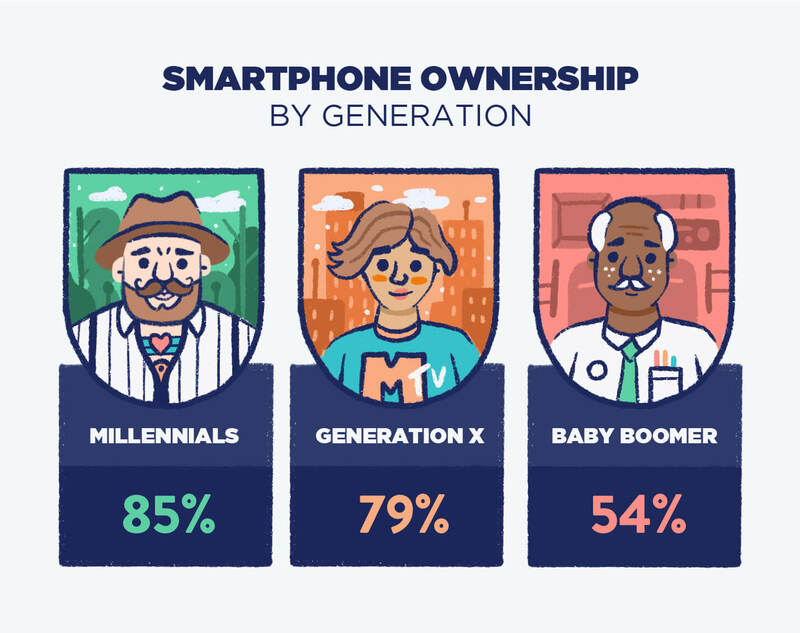 85% of Millennials, 79% of Generation X, and 54% of Baby Boomers own a smartphone.4 With the highest rates of mobile phone ownership and usage compared to other generations, millennials are demanding that businesses match their mobile lifestyles. So how have established companies tripped over themselves when marketing to millennials and what can we learn from their mistakes to improve our own marketing strategy? Basing a marketing campaign’s performance on public opinion can be tricky. Often, advertisements are mundane, insignificant parts of the audience’s day. Other times, however, public opinion speaks volumes to a campaign’s performance. And when targeting millennials, retaliation can be a real concern. The following examples of when marketing to millennials went horribly wrong can help prevent similar campaigns and their repercussions. 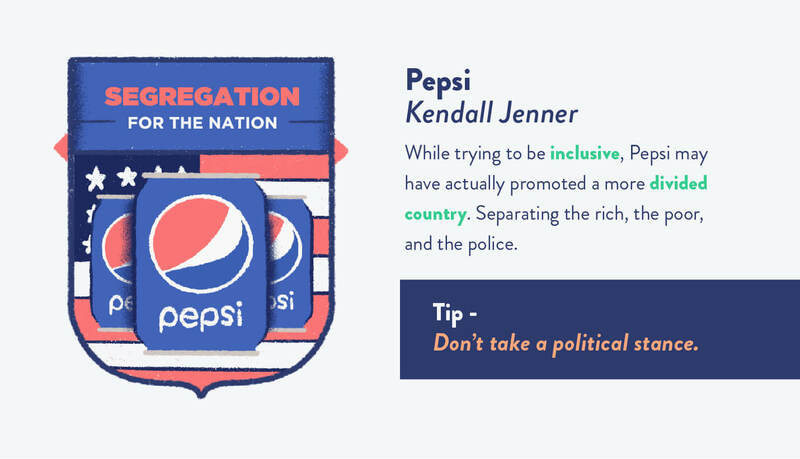 Pepsi released an ad campaign featuring Kendall Jenner as their spokesperson. The ad shows growing public unrest and a protest attracting millennials while the rich and famous Jenner is showered with attention. She decides to join the revolution and makes it to the front lines flanked with police, only to cross the invisible barrier to give a cop a Pepsi. The ad highlighted a divided nation and a caste system based on economic status. The ad seemed to make light of the social unrest in our nation, a problem many millennials are passionate about solving. It almost feels like Pepsi was implying our problems could be solved with the free-to-be-you-and-me-drink-a-Pepsi attitude. The swift fist of the internet’s public voting system came down hard on this campaign. Pepsi was forced to pull the ad and publicly apologize. The ratio of “thumbs down” to “thumbs up” on a YouTube version of the commercial is 4 to 1. In an attempt to win the millennial vote, the Republican Party released an ad campaign featuring a millennial Republican. The “stereotypical” millennial complains about having to check his bank account before filling up his gas tank because so much of his income goes to gas. He transitions to the country’s energy policy, citing solar, wind, shale, oil, etc. The ad only depicts millennials as a generation of complainers and features a single millennial as if he is representative of the entire generation. The consensus from millennials has been overwhelmingly negative. 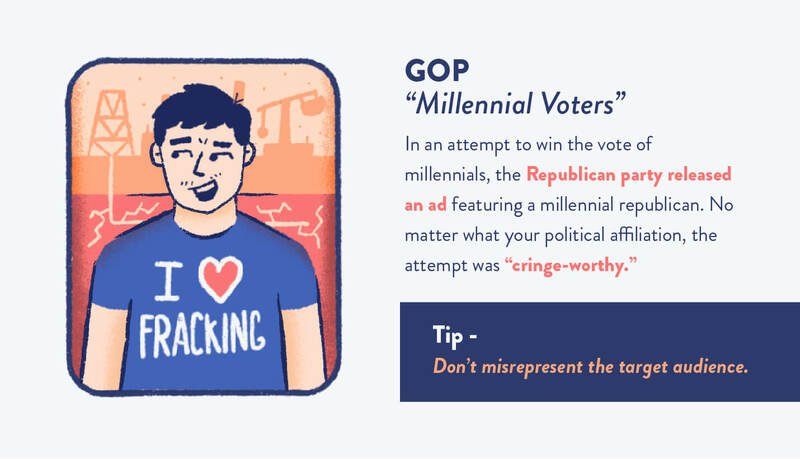 Collectively the campaign had almost 4,000 “thumbs down” compared to less than 250 “thumbs up.” The comments were almost exclusively negative and many brought up the GOP’s distasteful representation of millennials. Chevy ran a campaign with real people to show that most people are unaware of the Chevy lineup’s litany of J.D. Power awards. The results? Not so powerful. 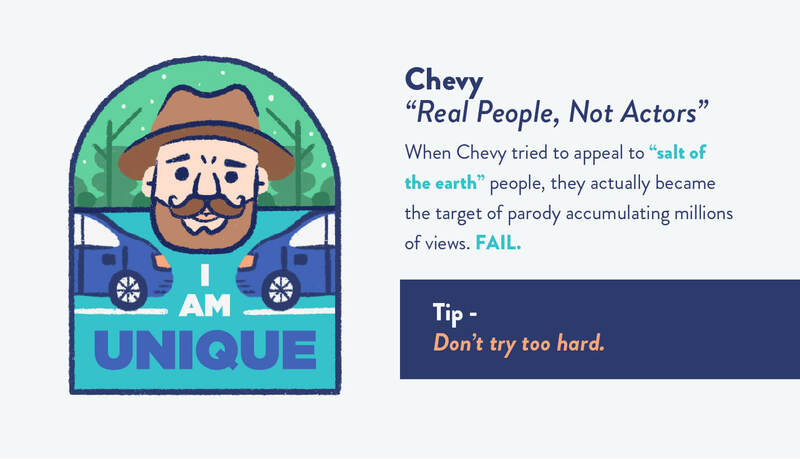 Shortly after the campaign launched, parody videos mocking Chevy’s campaign went viral and collectively garnered tens of millions of views — possibly even more views than the ad itself. The internet allows disgruntled millennials to strike back at a company or campaign they find offensive and actually have an audience of their peers. Whether on social media or through parody videos, poking the proverbial bear through millennial marketing could bring out the beast of backlash. The word fire has a different meaning to millennials. Millennials use it to describe something as awesome, cool, or perfect. Millennials have an overwhelming distrust for businesses that are driven solely by profit. Some studies have found that over 84% of millennials do not trust traditional advertising. On the other hand, 58% trust ads from their favorite digital influencers.10 This attempt to reach a wider audience actually isolates a large percentage of the ad’s millennial audience. Millennials want to be treated like individuals. Marketing to them in a way that feels like it was meant for them and only them.11 Segmentation and personalization can be highly effective strategies when connecting with the millennial sense of self. Create a brand focused on people, not profits. 61% of millennials worry about the state of the world and feel driven to make a difference.13 How can you give millennials a purpose in your marketing message? Position your product around the community and focus on how you can make a real impact together. Communities built on shared values are tight-knit and companies that support these communities reap the benefits. Sponsoring athletes, for example, is a great way to build a sense of identity around the brand. 87% of millennials have shown the desire to make purchases that have an environmental or social benefit.14 This trend towards an eco-conscious and ethical competitive advantage is not the most profitable but is a marketing advantage nonetheless. Position your product as an environmentally sustainable option or give to a cause with real social impact when marketing to millennials. But to circle back on the “keep it real” discussion, don’t claim to be environmentally or socially responsible if it’s not true. Be a positive force for change and environmental consciousness, but never make false claims about your company’s moral compass — running the risk of public denouncement. Although millennials are the most mobile of all generations — 85% of millennials own a smartphone — 78% of millennials also own a computer and 50% own a tablet. Millennials have come to expect a seamless experience across platforms and devices. Could you imagine if Netflix only worked on TVs? This would cut out a large segment of their global audience who don’t even own a television. Instead, users can start watching during their commute on their mobile device, pick up where they left off on their smart TV, and finish on their tablet — seamlessly. Whether you are a brick-and-mortar retailer, a utility service provider, or the hottest new mobile app, millennials expect an impeccable user experience across channels, platforms, and devices. If you plan to reach millennials, you need to be able to fit into their Instagram feed, or better yet: make your product Instagrammable. Starbucks, for example, is an Instagrammable company since a premium skinny vanilla latte aligns with their personal narrative (and looks great in selfies). Starbucks is also a great example of a company that can naturally fit into a follower’s feed, and with over 17 million followers at the time of this writing, that’s a lot of feeding. You ain’t gotta lie to kick it = Be honest. Squad goals = Build a community. Social justice warrior = Be socially responsible. Errywhere = Make it omnichannel. Do it for the ‘gram = Make it Instagrammable. 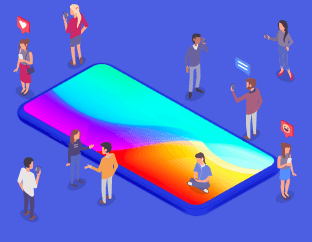 If you want to improve your marketing strategy and send targeted messages to your millennial customer segments (or others), check out CleverTap’s resources on psychographic, behavioral, and intentional segmentation and schedule a demo now to learn more.